Trolling Motor Stabilizer – The Reel Dr – Your Western Canada Warranty Center and Parts Supplier! The trolling motor stabilizer mount is extremely easy to use and heavily constructed for a LIFETIME of use. It is able to safely secure any trolling motor arm from 7/8" to 1-3/8" in diameter with no tools required! Our innovative design is the only mount which allows you to position your unit along any position on its horizontal, vertical, and radial axis! The arm of the mount is able to adjust to any angle between 0 and 180°. The arm is held in place by a pressure sensitive clamp which allows it to move freely when enough pressure is applied on it, yet stay locked in placed when it is holding the trolling motor arm. This means that when fishing you can remove your trolling motor unit and push on the mount to lay it down, making it great for storage purposes! When you are ready, simply lift up on the mount to lock your trolling motor in place, and prepare to cruise along the water with peace of mind! Our innovative design not only allows you to adjust to virtually any angle to accommodate various styles of boats, but it also allows you to positions the unit to the EXACT height required for proper installation of the unit. 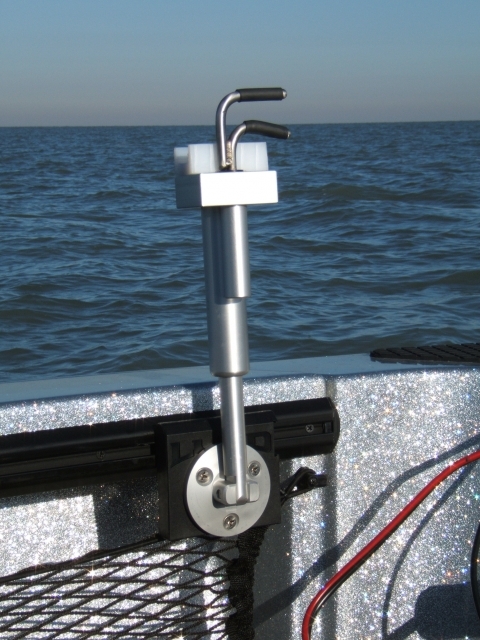 The outer stabilizer tube can be positioned to any height along the solid aluminum rod and can rotate 360° to ensure that the trolling motor arm fits precisely in the synthetic V-Channel. Once you have the unit positioned vertically and radially it can be locked in place by tightening the 4 set screws.